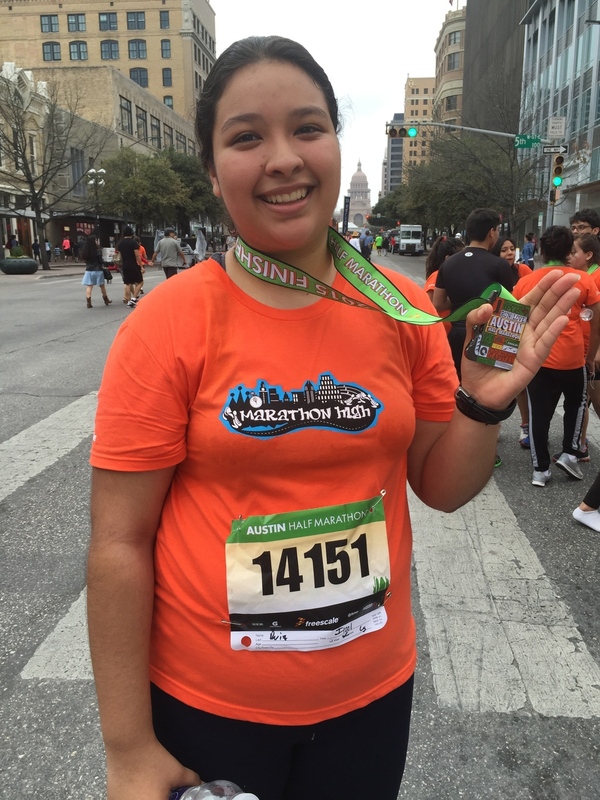 Itzel at the end of the Austin Marathon and Half Marathon in 2015. Itzel Ruiz is a junior at Ann Richards School for Young Women Leaders. She was a first year participant in 2015. When she graduates, Itzel will be the first in her family to graduate high school and attend college. This year I decided to join Marathon High at my school, because I heard of girls who had already been in the program and about how much they loved it. Also, I joined Marathon High because, I have never really been good at sports but running, although I’m not the best at it, is something I enjoy doing. I also joined because I mainly wanted to prove to myself that I could accomplish anything I set my mind to. I liked going to training this year because we were constantly working on getting better at running and trying to maintain a certain pace. I liked training because Matt and Sarah were really supportive and always pushed me to try my hardest. I also enjoyed getting to meet new people like one of the volunteer runners, Brian. During training I was slower than the rest of the girls so I usually didn’t have a buddy to run with, but when Brian starting coming to our practices he ran with me, and I was really grateful because he motivated me to keep going when I felt like I couldn’t keep running, and he also made our runs fun because we always had something to talk about. A few days leading up to the Half-Marathon, I was really nervous because I was questioning whether I was going to be able to run the 13.1 miles since I was sick, and on the morning before the race I was still feeling nervous and still had a cough, but I told myself that I had to be positive and think about how hard I had worked in order to prepare for this day. I was really happy to see everyone so excited to run the race and supporting each other. The first 3 or so miles of the marathon I was running alone and towards the end of all the racers because like I said before I’m not the fastest, but I kept telling myself that I shouldn’t care of what place I was going to finish in, and that instead I should focus on finishing. After the 5K mark I saw some of my friends from school cheering me on and even joining in to run for a little bit with me, and seeing them really helped me and it motivated me to keep going and picking up my pace, then a at mile 5 I saw my coach from school and my school principal who were out there supporting us and It felt really good to see that they believed in me. Matt and Sarah also came out and ran with me when I was running on 1st street and also told me to keep going and told me I was almost at the halfway point. Then at the around mile 6 I saw Lenora cheering me on, and Brian joined me, he ran the rest of the Half-Marathon with me, and it was great because he reminded me of the pace I had to be going at, he kept me positive even when I was starting to get tired towards the end of the race, with all the interesting stories he was telling me. He also gave me advice on when to pick up my pace and when it was okay to slow down, which got me through the hills on Enfield. Around mile 12 I saw my dad waiting for me and he ran the last mile with me and Brian which really motivated me to keep going. Towards the finish line when I was running the last half mile near the capital I started to feel less tired and more energetic because I could see the finish line, and other Marathon High coaches cheering me on and I could see my mom and dad and all my friends who came out to support me. After the Half- Marathon I suddenly felt how tired my legs were, but it didn’t seem so bad because I was really proud of myself for finishing. Finishing this Half-Marathon has only inspired me to keep going, this year I decided to run the Half-Marathon instead of the Marathon since I couldn’t go to most of the long runs and I thought it would be a good goal for me since I was just starting out, but next year I hope to return to Marathon High and improve my time on the Half-Marathon or even run a Marathon. Overall Marathon High not only helped me accomplish my goal of running the Half-Marathon but has also taught me that you can always keep going if you just focus on the next step ahead of you, and that even though there are times when you think you can’t keep going, you have to stay positive and tell yourself that you can, because you can!